I used to think that L.A. is a far and distant land. A visit to this enchanted place of swanky, buzzed-about eateries, and age old landmarks required a lot of effort, particularly with the driving. First, there's the 5 freeway to contend with, especially that section around La Mirada, which always moves slower than molasses. Second is trying to find parking in L.A. without paying a fortune. And third, the gas, which now tops out $3.50 per gallon in my 'hood. But a few Saturdays ago (May 12th, to be exact) we discovered that there's a solution. We didn't have to gas-up, drive to or park in L.A. to enjoy it! And the answer was right here under our noses all along: The Metrolink. It has a convenient route that zips from Tustin to L.A. and back, and as an added bonus, weekend tickets are discounted by half. 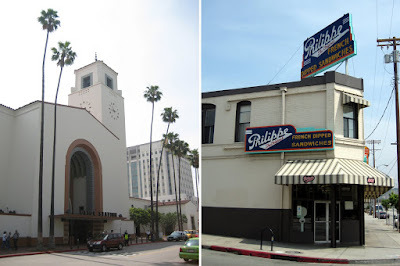 Using their handy-dandy schedule, we planned our outing and lunch at one of our favorite L.A. haunts: Philippe the Original for French Dipped Sandwiches. What follows is a detailed account of our escape from Orange County via the Metrolink. 9:00 We drive from our home in Irvine to the Tustin Metrolink Station. It takes all of five minutes. 9:20 We buy two roundtrip tickets from the automated kiosk. Total for us: $15.50. 9:41 The train arrives and glides to a stop to the smell of grinding brakes. 9:50 We take seats in a car that is virtually empty. 10:00 After making stops at Santa Ana, Old Towne Orange, the train stops in Anaheim Stadium, where I see a large wave of red-t-shirt-wearing marchers descending upon the parking lot for AIDS Walk Orange County. 10:06 We take a nap as the train leaves the Fullerton station and speeds by office parks, warehouses, walls scribbled with graffiti, en route to L.A.
10:45 The train arrives at L.A. Union Station. We stop for a minute to marvel at the beauty of its cavernous waiting room. Then, it's a short walk to Philippe. 10:50 We arrive at Philippe and find that there's hardly a line. Since it's only two persons deep, we get our food immediately. We pat ourselves on the back for beating the rush and also, since we brought our own soda, we save a few bucks. 11:00 We take our food, which weighed heavily on the well-worn tray, to one of the many open booths. The floor, by the way, is covered in sawdust and a bit slippery, but this is just the way it has been for decades. My lamb sandwich is just as good as I remember: thick hunks of slightly gamy meat inside a roll soaked in jus. But no Philippe French Dip is complete without a few drips of that incendiary hot mustard, which sit idle inside plastic containers and waiting on every table until you decide to empower it. This is the stuff of legend, and in other incarnations, conceivable as a chemical weapon. We finish off the meal with a classic banana cream pie, which true to its name, consists of only banana, whipped cream, and pie crust. 11:25 Stuffed, we set out to walk off our lunch around Chinatown, which starts literally two steps from Philippe's doorstep. Just as we walk by a shop that butchers live chickens to order, my camera battery dies. But no camera can capture the stench, which is detectable within a few hundred yards of the place. It is an unmistakable barnyard smell of feathers and chicken poop -- something that is foreign to someone like me who lives in an Orange County masterplanned community. Once we get closer, we hear the clucking and a few stray feathers that float by, suspended in the air. I take a peek inside and see that there's a concrete floor that has a drain in the middle. There's also a marquee with prices for all kinds of poultry. I consider bringing back a freshly-killed chicken with me on the Metrolink. But ultimately, I decide against it. 11:30 We continue our stroll through Chinatown and walk into the labyrinth that is Dynasty Plaza. Quickly we realize, we're lost -- lost in a maze of fabric, garments, and other oddities. Trapped inside this firetrap are hundreds of vendors, all selling what seems to be the same items. There's skirts, suits, blouses, t-shirts, pants, jeans and Chinese dresses. It's mind-boggling how much merchandise can be crammed inside a space no larger than a single car garage. I notice that most of the shop owners are Vietnamese since they speak with that distinctive staccato accent. But whether Vietnamese or Cantonese, all seem to pronounce "dollar" as "dah-lah," and all are masters of negotiation. We manage to haggle a skirt down from $12 to $10 (but not $9), and were ready to buy, but had to walk away when we couldn't find one that didn't already have a stain on it. 11:45 We finally manage to find ourselves an exit and get back onto the street. 12:40 After a good hour of walking, our legs crap out -- a result of years from atrophy and door-to-door commuting. 12:50 We decide to head back to catch the 1:30 train. But first, a restroom stop at Philippe. Once inside, we see that the line to get food is now all the way to the back wall. Insane! Thank goodness we got here early, we thought. 1:00 On the way to the station, we stop by Olvera Street. We are somewhat disappointed to discover that there are more white tourists than there are Mexicans. They pack the restaurant patios, sipping margaritas and munching on chips. One thing this area has going for it is a more photogenic atmosphere. But the stuff sold in the equally cramped shops are a little more frivolous. There are maracas, ponchos, oversized sombreros and toys that I guess are all made in China. Ah the irony! 1:21 We make it back to the train station with plenty of time to spare. 1:30 I start this journal as the train leaves southbound to Orange County. Been there numerous times throughout my life. They used to sell Clove Life Savers there. Not anymore but you can still see the slot for them on the candy rack. That was awesome. I used to live just down the street in Little Tokyo. I remember running in for Philippe's when my wife was out at school. I always got the beef, though. You should have kept walking to Little Tokyo and eaten at Daikokuya. :) Wander through the shops or the Japanese American National Museum until you were hungry again. Hi Elmo - These days with gas and prices, and the aggravation of the parking lot that is called the I-5 and 101, rail is not a bad choice. It's quite relaxing! You sure did make quite a trek for your Philippe's fix! I think I might stop by this weekend. The train ride ain't a bad idea, but the downside is when you shop the convenience of a trunk would be nice. Great alternative to driving there, Elmo! I didn't realize how close/convenient Chinatown would be. especially love the fact that their coffee costs less than a dime. oh man, i am totally craving their lamb dip now. must...head...up... this...weekend. oh and btw, LOL re: "dah-la"! That candy booth is a trip. And Clove Life Savers?! That's even more trippy! I used to get the beef too...until I tried the lamb! Now it's all lamb. Always. Aya! Is Daikokuya in Little Tokyo? Geez. Why did I think it was in Torrance. OK. That's it. I'm getting back on the train. I hope I don't have to walk through Skid Row. You got that right. AAA estimates that the trip from Irvine to L.A. in a car is something in the order of $30. I calculate the gas cost to be around $10.00 round trip (assuming $3.50/gal for gas, 77.6 miles roundtrip, and a car that does 25 miles/gal). I'd rather take the train and relax! True. Trunk space would be nice. But that's assuming you can bargain those vendors down to make it worth your while. Such a convenient thing. And as WC mentioned, Little Tokyo isn't that far off either. But imagine. You can have dim sum at Empress Pavillion without the fuss of driving there. The trip is a relaxing one too. Their lemonade is pretty great too! 60 cents if I recall correctly. If I ever do need to go to L.A. by car, I bypass that crummy section of the 5, by taking the 5 North to the 91 West to the 605 North and back to the 5 North. I guarantee, you'll save at least 15 minutes during rush hour. California's Gold had a show about Philippe's several months ago... I had forgotten about the restaurant until I read your post! I'll have to try the metrolink, I didn't realize how affordable it is on the weekends. 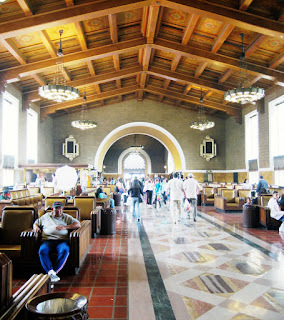 From Union Station, it's maybe a 10 minute walk to Little Tokyo? When I have visitors, I used to just park in one spot and do all three neighborhoods at once. :) And Daikokuya's new hours, they're continuously open so you don't have to try and time it anymore. This seems like a great way to go to Chinatown. I have to check out the train soon! I think, from now on, I'll always be taking the Metrolink to Chinatown (and Philippe). Next, I'll take it to go to Little Tokyo! Be sure to check out my Blogger friends who are in L.A. They have a wealth of knowledge on L.A. restaurants. Let me know if you have specific questions on Orange County eats, etc. It truly is the best way to get there. Best part is, when I got back home, I wasn't tired or grumpy from driving. I am positive you'll feel the same way. Way to go on making that trip. Of course, your next big mission is to go to West Hollywood or the valley for those sushi joints. Did you checked out any good Chinatown eating joints that you might put up for your next review? wow! Tustin to OC... I will have to try that sometime. If only they would make a train to LAX. That would be awesome. Java Spice is good. I like it. Not as much as I like Pondok Kaki Lima in Duarte. But it's decent for a quick meal when I'm in the area. Absolutely. I want to explore Sawtelle if it is possible to do it without driving and via Metrolink (although I doubt it). I didn't check out any Chinatown eats this time since I was too full from Philippes. But next time, for sure! It's a great trip. Cheap. Clean. Relaxing. I encourage everyone to try it. Hey. It's been awhile. Sorry. As y ou can tell from my blog, though, life has been crazy and eventful lately. Seems like you had a wondeful day! The sandwiches wound yummy, and you're trip to Chinatown makes me think of only a handful of things I miss about the Chicago area. Congrats on your new baby! Hey, you got more important things to attend to than read this little blog. I'll be checking your blog often to see Xander's homecoming. I love Savoy. Hainan chicken there is better than I've had anywhere. And the escargots are very good too. It's been a while for me though. Time to go back soon. love taking the metrolink, except i'm always terrified i'll miss the last train. last time i tripped on the steps up to the platform and fell all over the place. what a hot mess!! mm, philippe's, haven't been in forever! Will definitely think about taking the Metro down to the OC for some good eats too! You had me at MoCA. I've been dying to see MoCA, but again, didn't realize it was there, near Union Station. This Orange County yokel has a lot to learn and a lot to see when he takes the Metrolink back to L.A. It's good banana cream pie. Banana. Cream. Pie crust. It's all it is. Oh yeah, some slivered almonds on top. Also worth the trip is the custard cups, which they dust with just the lightest sprinkle of nutmeg. Yuuuummy! It's dirt cheap too, IIRC. Aah, now I'm looking forward to the secret recipe for those milk buns! First, though, I have to taste one from JJ's. You make them sound so irresistable! Aw shucks. T'weren't nothin'. I love the Metrolink just because I'm a cheapskate. But it does make me feel good that I'm not contributing to carbon dioxide emissions just because I want a French Dip Sandwich! just discovered your blog. awesome. thank you for providing such thoughtful and honest reviews. and btw, your pictures are really good too. 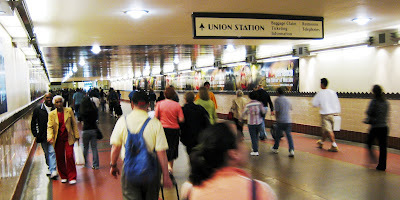 especially the one of the busy commuters in union station. Thanks! I'm glad you found me. That photo of the commuters was a lucky shot. I normally can't get shots that good. It took me a while to realize that the Metrolink is a valuable resource. Next, I'm taking it down to Oceanside! I take the Metrolink from Oceanside to Irvine every day and although I'm not condoning this I have never been asked for proof of ticket. Just an FYI. True. They didn't check our tickets on the way up from L.A. either, but on the way back an LAPD officer went through each car and checked tickets. He had a gun too.